Our culture sends the message that birth is no big thang. It's pretty ordinary, happens everyday, is nothing more than a baby coming out of a hole. I was recently asked to be an "expert" on a tele-class titled, "What Nobody Tells You To Expect When You're Expecting." My specific role was to speak about birth, being that I'm a Birthing From Within childbirth mentor, but I have had experience (read: drama) in fertility and parenthood as well, so I was able to open up my yapper about all of it. But the specific question that my friend and colleague, Sheryl Paul, presented me with was this - what are the dominant messages our culture transmits about birth and how can we give women a more realistic expectation of what it will be like? My answer was and is this: I believe that our culture sends the message that birth is no big thang. It's pretty ordinary, happens everyday, is nothing more than a baby coming out of a hole (whether it be a round one or a man-made incision) and it can be managed by a myriad of medical techniques. One of the fallacies here is that this may be what it looks like from the outside - especially from the point of view of someone who has witnessed birth almost everyday for years - but for the woman doing the overwhelming work of labor from the inside, it sure as hell feels like something more. Just ask any woman who has given birth. She is walking the path of every mother before her and the veil between her and the first women who ever stepped foot on this planet and bore a child is the thinnest it has ever been. Even if a woman uses pain-coping techniques, self-hypnosis, has the strongest epidural possible, or births by Cesarean and does not experience all of the physical intensity, a human being is being born through her and emotionally, spiritually and physically, she is being turned inside out. And that aspect - the other-wordly, transformative aspect - cannot be managed by anyone but her - no medical procedure can take that reality away. That is all pretty bleepin' extraordinary! But no one talks about that part. Instead, there are car seats to buy and ultrasounds to get. So, what can we do to convey to a woman that birth is a tremendous rite of passage for the mind, body and soul? To let her know that when she gives birth, she will be fighting a battle of sorts, trying to hold on one breath at a time. That she will be tested in ways she never knew existed. That she will go into labor one woman and come out a different one. That she will be taken to an alternate universe with only her connected baby as her companion. That fear doesn't serve labor. That when the tremendous act of giving birth cannot be managed by the heart, soul and mind of a birthing mother, the body is fighting an uphill battle. How do we convey these more realistic messages to women without scaring the pants off of them and causing the fear that we're actually trying to help them let go of? - When talking to women who are about to give birth, listen to them without getting into your own birth story or birth stories you've heard. Things they will say will trigger certain images and beliefs for you and you might even feel yourself wanting to get defensive or disagree, but really try to be in the moment and listen to her. Make the conversation about her, not you. You will be amazed how much change this one piece can make. Think about it, during your entire pregnancy, did one person ever listen to you without giving you their two cents? - If a pregnant woman asks you about your birth, instead of dumping your entire, play-by-by medical version of the story on her, tell her about the moments in which you didn't think you could go on and then how you did. What tools did you rely on? Give her something positive to take with her. Something that if she thought about it during labor, would give her something useful instead of a lot of worry. And, letting her know that other women had moments of doubt but pushed through may be just the thing she needs to help keep going in labor. - Instead of, or in addition to, a traditional baby shower where the focus is on stuff (yes, I had one too), consider having a Blessingway (also called a Mother Blessing) for the mother-to-be. A Blessingway is more of a ceremonial celebration that honors the mother and baby and focuses on the birth as a sacred rite of passage. There is no commercial gift giving emphasis. But there are various activities and "gifts" that are made and given -- prayer flags, necklaces, belly casting and henna on the sacred belly, just to name a few. 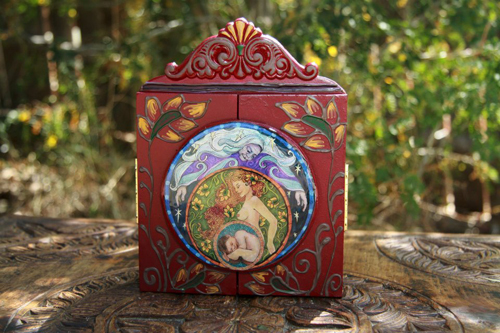 - Create a candle circle for the birthing mother. The idea here is that when the mother goes into labor, an email or message will be sent out to all of her "allies" who will then light a candle for her until she makes it out to the other side. This can provide amazing strength and connection for a birthing mama - knowing that her friends and family are holding a space for and honoring her. Having her own candle at the birth as a reminder of the other candles flickering for her can be a great visual reminder for times when she is not all there, but in LaborLand. A nice idea is that at a Blessingway or a baby shower, candles can be distributed. - If you have a close friend or family member about to give birth, think about giving or making them something from you - a piece of jewelry, a statue, a rock, art, etc. - something tangible that they can bring to the labor with them. Perhaps it was something you had at your labor! Present it to them in a special way and perhaps share some words of encouragement that also give a nod to the intensity of the ordeal ahead. 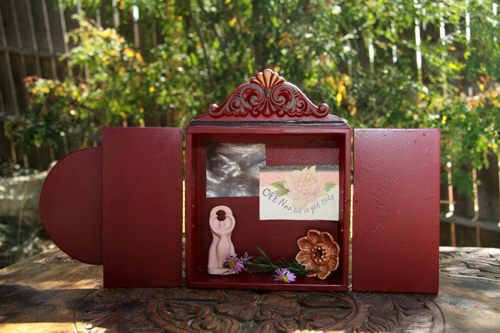 An amazingly talented local Denver artist, doula and mother, Amy Swagman, makes incredible portable birth altars (among many things) in which mamas can collect these sacred tokens and photos and bring them with her to her birth as inspiration and strength may she need it. What a beautiful, meaningful and useful gift. - Allow women to talk about their fears surrounding birth. Sure, you may feel uncomfortable because you don't want her to worry her pretty little head, but you might actually be more supportive in a real way if you allow her to worry her pretty little head and validate her for having fear - help her to know that it's completely normal to be scared of something she's never done before. Maybe even tell her what you were scared of before labor (or some other ordeal) and how you pushed through it. You don't have to wrap her feelings up in a box with a neat and tidy bow - you can let her voice these fears and maybe even ask her what her specific fears are. If she'll open up to you, go ahead and ask her what she might do if that situation did present itself (without saying what you would do, unless she asks). You'll be helping her allow the feeling to be acknowledged, processed and most likely released, rather than lingering and waiting to show its ugly face during labor. Giving women a more realistic message about what birth entails and what it may require of her physically, emotionally and spiritually, is just one of many things we can be doing to help mothers have more empowered births, which set them up for a more pleasurable post-partum and lifelong mothering experience. There can be much trauma and sadness when women expect that birth is no big thang, but then find out it is quite the thang. We have the power to change this expectation by having honest and compassionate interactions with expectant mothers, even if it is just one mama at a time. Learn more about Brandy and her current classes, workshops and Mamas Circle schedule at www.mothernurturedenver.com.